Young scientist, a photo by The Bacher Family on Flickr. I got to serve as a chaperone for a field trip by Daniel's class in February, across the road from his school and down a little trail through the woods to the edge of the Nisqually River. Twice a year the 5th and 6th grade students in his Summit Class conduct water testing on the river, checking for dissolved oxygen, nitrates, turbidity, pH, and other factors. I was so impressed and proud of the kids, who dived into the project with the care and seriousness of real scientists. I wandered among the subgroups of kids taking pictures. 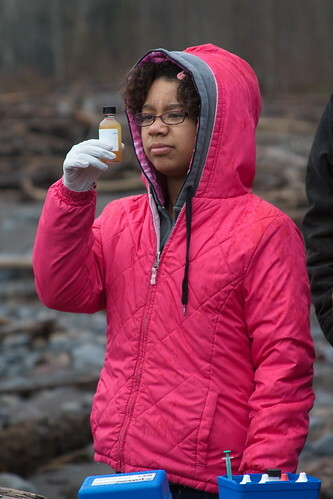 This is one of my favorites, of a young scientist inspecting her sample with an expression that appears to be a mix of interest and satisfaction.